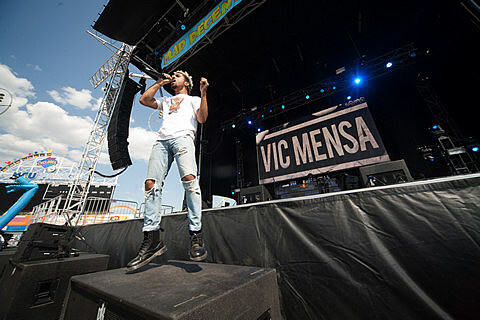 VIc Mensa has been playing shows, most recently hitting NYC to open for Iggy Azalea in late September, and he’ll return for the next show in FADER and vitaminwater’s #uncapped series happening October 15 at Gotham Hall (1356 Broadway). Also on the bill is DJ Envy and a surprise headliner. Any idea who it could be? The show is free but you have to RSVP, which is open now. All of his dates are listed below. In related news, Vic Mensa collaborator Kaytranada is currently on tour, hitting Bowery Ballroom tonight (10/8) (tickets) and MHOW on Thursday (10/9) (sold out). His remaining dates, and Vic’s dates, below.